Air vents play a vital role in most buildings. The vents around your home are intended to keep the air supply in your rooms clear of dust, excessive moisture and bad smalls. In your place of work, it can be even more crucial for your vents to be effectively clearing the air of irritating substances. Let them get too dirty, and vents start to work against you. Your ventilation systems can become increasingly less effective over time due to blockages from dirt and large amounts of debris. For these reasons it is very important to have your air ducts, HVAC units and air vents cleaned periodically using thorough professional methods and solutions. Mold can form within filters, ventilation duct surfaces and the walls that surround such devices. We understand that in order to completely remove mold growth, you have to eliminate the thriving bacteria that is causing the mold to develop in the first place. This is often almost impossible to do with conventional amateur cleaning methods. We use powerful tools and expertly engineered solutions to attack bacteria and mold within air vents. One the bacteria and all form of mold are cleared away, the conditions within your vents will become inhospitable for any further growth to thrive or spread. It is possible in some situations for vents to become so blocked and disrupted by debris and dirt build up that they no longer effectively clear air at all. Filters can be completely blocked and fans can be so submerged in sticky substances and clutter they cease to function at all. When this happens the quality of your air supply efficiently plummets in an instance. Contact us today to have your air vents cleaned with expert techniques. We can provide a level of sanitation that you would never be able to achieve without the equipment and solutions that we make full use of. 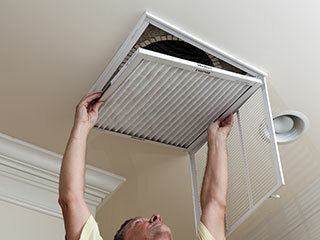 Have your HVAC repairs carried out by highly experienced technicians. Call now to find out more or to book a visit.